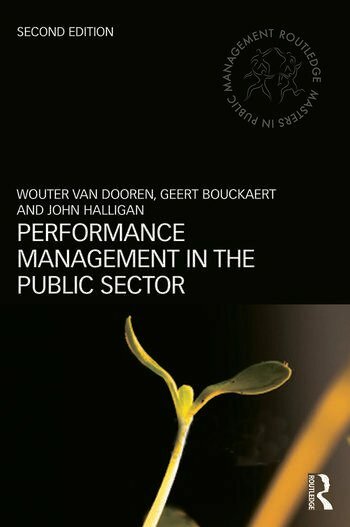 Performance Management in the Public Sector 2nd edition offers an approachable insight into a complex theme for practitioners and public management students alike. Wouter Van Dooren is Associate Professor of Public Administration at the research group Public Administration & Management of the Department of Political Science, University of Antwerp, Belgium. Research interests include performance measurement and management, the political dimensions of public administration, accountability and participation. Geert Bouckaert is Professor at the Public Governance Institute of the KU Leuven, Belgium, and Visiting Professor at the University of Potsdam, Germany. He is President of the International Institute of Administrative Sciences (IIAS) (2013–16) and was the President of the European Group for Public Administration (EGPA) (2004–10). John Halligan is Professor of Public Administration, Institute for Governance and Policy Analysis, University of Canberra, Australia. His research interests are comparative public governance and management, performance management and public sector reform.